First Aid is an essential skill for non-healer characters and it’s almost trivially easy to level. Just get a pile of cloth and camp the trainer until you hit you level max. Once upon a time various books and a quest were required to train to the next level in first aid. Nowadays you can get all the skills from your trainer. Buy or farm a ton of cloth and max this skill out. Use the excess cloth to level your Tailoring skills, or visa versa. 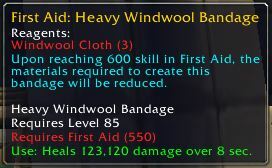 Mists of Pandaria will introduce some new bandages, will have a skill cap of 600, and you’ll need to be level 80 and at least 500 skill to train up. In Warlords of Draenor you will need to by 90+, but your skill level can be “1.” You will quickly find a scroll that, when used, will raise your first aid skill cap to 700 (it will not increase your skill, just the cap.) This is perfect for players boosted to 90. This scroll will also teach you all of the Draenor 1st Aid recipes. 525-600, Zen Master First Aid, Requires level 75, need 500+ skill to train up. 1-700, Draenor Master First Aid, Requires level 90. Note that you only need to have a skill of 1 before making any of these. Specials: The best use for these seems to be in world PvP. Blackwater Anti-Venom – Cures and protects against poisons. Fire Ammonite Oil – Cures and protects against diseases. Amm. Oil: 10x Fire Ammonite Tentacle. Congratulations on your mastery of the First Aid skill! Hey, I own a WoW Bot related site. I like your site, we should link to each other, since our sites are semi-related :).